An e-mail will be sent and please respond within 48 hours! This one is for the dads, the boys and MOMMY GAMERS!!!! Online games is becoming increasingly popular due to the constraints of the economy and the ease for some sit in your chair for hours entertainment. It's a great way to kill time, have fun with your loved one's if they play or to meet new people in a fantasy world. Never tried an online game before? Here's your chance to try the game for FREE! Mythic is even offering a ten day free pass to try it out but with the game itself, you will get free playtime. If you have never heard of a MMO(RPG), it's a is a Massively Multiplayer Online Role-Playing Game, more commonly called an MMO. In MMOs (including Dark Age of Camelot ), tens of thousands of people can adventure together or separately in worlds that are created by a game company. The most successful MMORPGs to date have several hundred thousand monthly subscribers. These types of games are created by teams that can range in size from forty developers to over a hundred developers, and can cost over ten million dollars to produce a AAA title. Some games currently in development are rumored to cost many times that. Besides the fact that tens of thousands of people can play this type of game at the same time and interact with each other, the biggest difference is that MMORPGs can be constantly updated with new content and challenges for the player. In the case of Dark Age of Camelot, Mythic creates new content and improvements for the game on a regular basis. Throw in five retail expansions, and you have a game that since it was released in 2001, has increased dramatically in size, scope and features. This type of dedication to new content is what sets online games apart from single player games. Experience the glory of Realm vs. Realm! 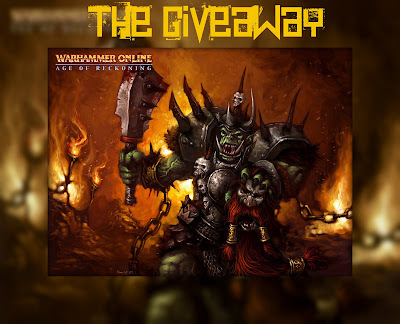 Declare your allegiance and join hundreds of thousands of mighty heroes on the battlefields of Warhammer Online: Age of Reckoning to experience the epic nature of war. Enter a grim fantasy world where the armies of Order (Dwarfs, High Elves, and Empire) and Destruction (Greenskins, Dark Elves, and Chaos) collide to determine the fate of nations. Invade enemy lands, besiege imposing fortresses, and sack sprawling capital cities for the glory of your Realm. Wield devastating magic and deadly weapons, battle monstrous creatures, and join your brothers-in-arms in epic Public Quests™. Climb the Bastion Stair, carry your Guild Banner into battle, and unlock the secrets of the Tome of Knowledge as you travel the world. Sharpen your blade and prepare to unleash your inner mutation-the Age of Reckoning has begun and WAR IS EVERYWHERE! •Realm vs. Realm (RvR) gameplay means you will never fight alone, but as part of an army of allied players sworn to defend your homeland and conquer enemy Realms. Your every action-every quest completed, every battle fought-contributes to the war effort and can turn the tide of battle, bringing victory to your Realm! •Experience the camaraderie of fighting side-by-side with allied players against otherwise insurmountable odds in groundbreaking Public Quests. These cooperative PvE encounters unfold across multiple stages and allow solo players to experience the glory of RvR. •Embark on the endless quest to complete the Tome of Knowledge and unlock Warhammer lore, detailed monster information, new abilities and rewards, and major story plotlines. The Tome is also the story of your life in the game, tracking your achievements to share and compare with others. •Explore massive Living Cities that become more or less prosperous based on a Realm�s overall performance in the ongoing war. Navigate a maze of twisting streets, visit the local tavern, explore a dark under-city, and meet colorful personalities in a city full of adventure. •Advanced guild features give unprecedented control to leaders and members, and make guilds an integral part of the war efforts. Guilds can create unique heraldry, capture and claim keeps, and earn Guild Tactics as they grow in power along with their members. 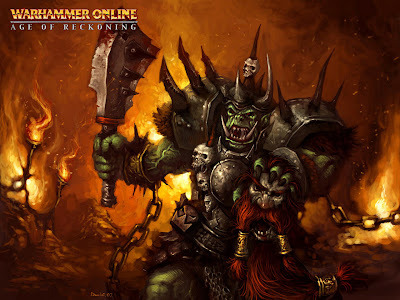 Drawing from a quarter century of highly detailed source material, Warhammer Online: Age of Reckoning brings Games Workshop's fantasy world to life in a way that will allow players to create characters destined for great deeds and glory on the field of battle. Category: Massively Multiplayer Online Role-Playing Game - Online play requires a subscription and Internet connection. To win, you must provide a comment and follow this blog. Subscribing to my blog (two entries so leave two comments). Follow me on Twitter (two entries so leave two comments). Giveaway ends October 15, 2009 at 10:00 EST and winner will be chosen by random.org. This game sounds like lots of fun. Something my husband and sons would love. Thanks for this chance. my kids would enjoy it i bet. I follow & would love to play this! Hey I would love playing this game. It reminds me of World of Warcraft, and i am a mommy gamer. I follower, and I'd love to win! I'm a mommy gamer and hubby has been a Warhammer fan since he was in school! I would love a chance to try Warhammer. We are WOW players but I am getting a little bored and would love to try something new!